The Sony Xperia sola, like the Xperia S, has a slightly revamped custom skin, but it's still Gingerbread underneath (2.3.7). The Ice Cream Sandwich update is scheduled for Q2 of 2012. We've got a video demo of the user interface below. The Xperia sola has the usual five-pane homescreen (you can't add or delete panes), with four docked shortcuts (two on either side of the launcher shortcut). These are visible on all five homescreen panes and are user configurable: they can be either single icons or folders with multiple items in them. Another little gimmick is Floating Touch. We said it already, the technology is limited to the web browser but the homescreen lets you experience and practice it. The Xperia sola is touch-only for the most part - that includes widgets, shortcuts, controls and sideways swipes. Still, a small part of it can respond to hovering fingers. It's the stylized smoke in the center of the default live wallpaper on the homescreen. The fumes will swirl around in reaction to your thumb hovering over. 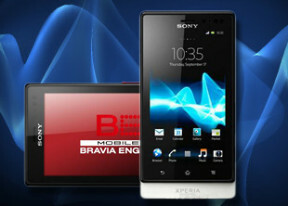 The Xperia sola has some custom-made Sony widgets in addition to the standard set. Those include the Timescape widget (there's a dedicated app too) and a Mediascape-like widget for photos and videos (the actual app isn't there anymore, the standard gallery is back). The lockscreen shows notifications for Facebook events too. A cool new addition to the lockscreen, unseen in the old Xperia line, is the music player widget, which lets you control music playback without unlocking the phone - we'll get back to this further on. The Sony Xperia sola is powered by a dual-core NovaThor U8500 processor clocked at 1 GHz and 512 MB of RAM. Those aren't the kind of specs to set the world alight but they are still pretty great for the class. We ran our usual round of benchmarks and compared the Xperia sola to Sony's current flagship, the Xperia S, as well as a selection of upper-midrange competitors. The Samsung Galaxy S Advance is among them, powered by the same ST-Ericsson NovaThor chipset, with a slight advantage in terms of RAM - 768MB over 512MB. We begin with BenchmarkPi, which measures the CPU computing power of the NovaThor U8500 chipset. The Xperia sola is bottom of our table but not far behind the Xperia S and the Galaxy S Advance. In Linpack the Xperia sola got the better of the HTC One V and the Samsung Galaxy S Advance, but did worse than the rest. BrowserMark adds HTML5 to the equation but and sees the Xperia sola drop down the ranks. It still comfortably beats the One V, though. NenaMark 2 is where the GPU gets to show its worth. The Xperia sola got the lowest score here at a measly 27.7 frames per second, which is some way behind the competition. The Xperia sola goes about most tasks hassle-free and most users will be pleased with its performance. It didn't win any awards in our benchmarking but will not let you down in day-to-day work.